Whoop-i-e-e-ee! 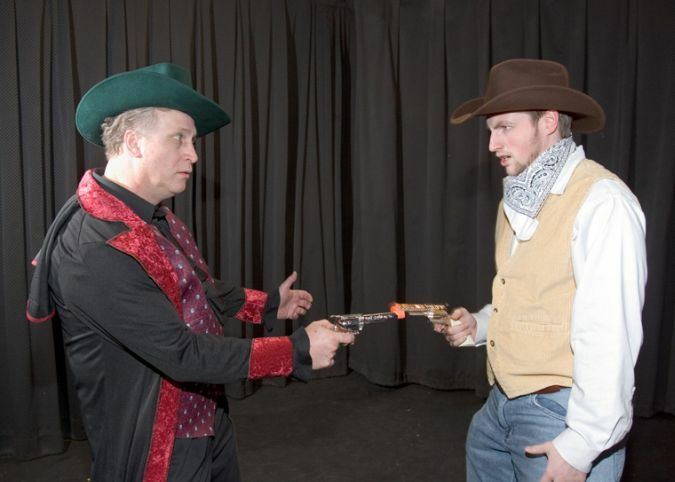 Hold on, ’pawdners,’ for a rip-snortin’, rootin’-tootin’ musical spoof of the Old West. This fast-paced comedy is filled with a goofy stable of hilarious characters: our trailblazin’ hero, Chuck Wagon, our sweet heroine, Candy Cane and the villainous crooked card dealer, Smiling Slade Claggett. A wagon train breaks down at Whistling Skull Rock, outside the tiny town of Vinegar Bottle (famed for its ’I’m O.K. You’re O.K. Corral’). The wagon train promptly gets robbed by the mysterious outlaw known as ’The Snake.’ Through a crazy twist in the plot, Chuck is accused of being the bandit. Proving his innocence isn’t easy... but it is a hoot! Who can forget the host of other characters that add extra spice to this wild romp? Read more...There’s Wild Bill Hiccup, the dancing Hamm sisters (Virginia and Glazed), fascinating Señorita Juanita and Claggett’s evil ally, Sue Flay. 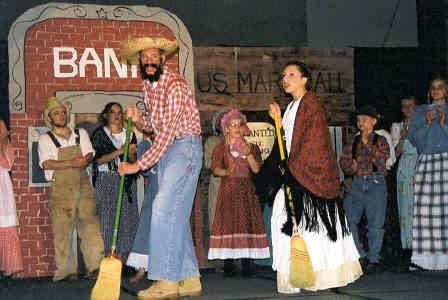 Toss in an election for the town mayor, an old Spanish land grant and some singin’ and dancin’. 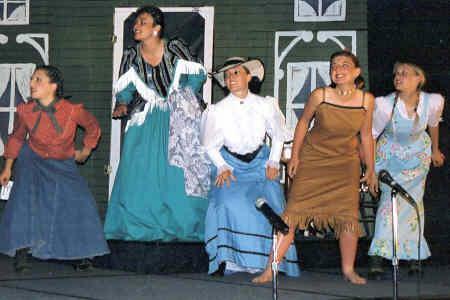 Then mix with mirth, melody, action and a laugh-a-minute and you’ve got some idea of what happens when those wacky wagon wheels went rollin’ west. 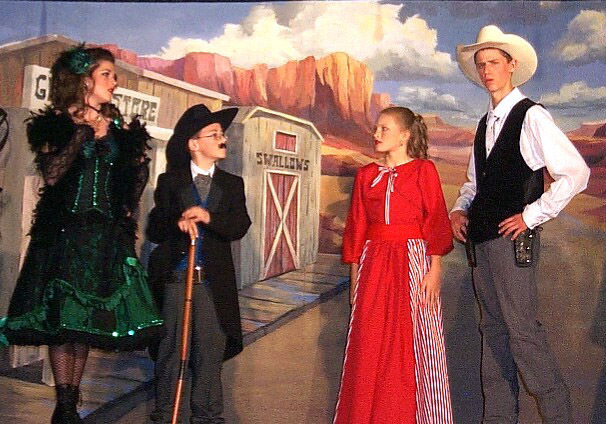 Sensational tunes include the rousing ’True Blue,’ the spirited ’El Fandango,’ ’Low Noon Shootout,’ ’A New Broom Sweeps Clean’ and the haunting ’Ballad of the Hanging Tree.’ With simple sets and easy rehearsals, produce this show and you’ll know how the West was fun! Wagon Wheels West... hands down one of my favorite shows of all time. The script and the score are solid. 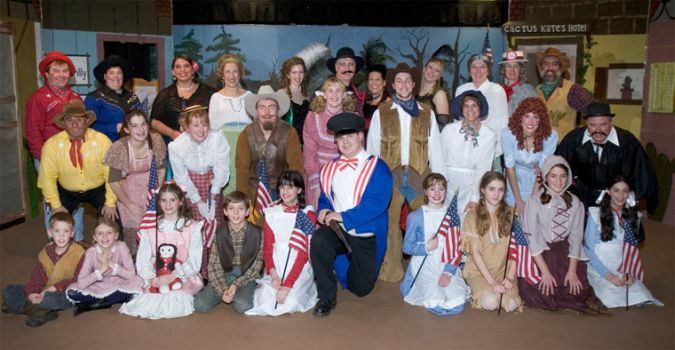 Creative characters, great potenital for educational theatrical experiences including character development. I was in this one when I was in school and was so glad to share it with my students. I will do it again and again.